Slice the potatoes lengthways. Heat a large non-stick frying pan, add the oil and potatoes and sauté the potatoes for 15-20 mins, stirring occasionally until the potatoes are evenly browned and golden. Meanwhile, roughly chop the capers, spring onions, parsley and mint and mix in a bowl with the lemon zest and juice, a little salt and freshly ground black pepper. 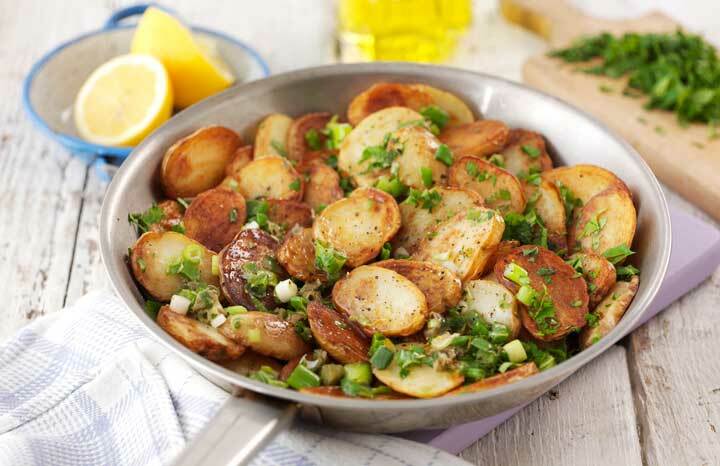 When the potatoes are cooked, remove from the heat and stir through the herb mixture. Serve straight away.